The Tzu Chi Foundation (Hanyu Pinyin: Cí Jì, Wade-Giles: Tz’u Chi, Simplified Chinese: 慈济基金会, Traditional Chinese: 慈濟基金會) is one of the two largest Buddhist organizations in Taiwan (the other being Fo Guang Shan). Tzu Chi was founded by Master Cheng Yen (1993 Nobel Peace Prize nominee), a nun, on April 14, 1966 in Hualien, Taiwan, after she was inspired by her master and mentor, the late Venerable Master Yin Shun (significant proponent of Humanistic Buddhism) with the great expectation of: «work for Buddhism and for all sentient beings». The society started as a group of thirty housewives who saved a small amount of money each day, and has grown to have over 4.5 million members worldwide today. Whereas many Buddhist societies focus on personal enlightenment and meditation, Tzu Chi focuses on community service and outreach (especially medical, educational, and disaster relief). Tzu Chi maintains a small number of nuns, and conducts its mission via an international network of volunteers. The volunteers are easily recognized by their uniforms (navy blue shirt with a ship imposed on a lotus flower as a logo on the left breast; white pants, shoes and socks; and a black belt with the same lotus ship logo as a clasp). 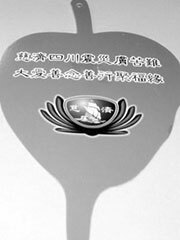 Tzu Chi has many suborganizations, of which the Tzu Chi Collegiate Youth Association (慈濟大專青年聯誼會) being one of the most prominent. With chapters at universities worldwide, Tzu Chi Youth allows the university student to be involved with Tzu Chi’s work on both local and international levels. Tzu Chi remains a non-profit organization and has built many hospitals and schools worldwide, including a comprehensive education system within Taiwan spanning from kindergarten through university and medical school. The organization was heavily criticized in the early 1990s for spending much of its focus in relief efforts outside of Taiwan, but criticism ended after the 921 earthquake, when the organization was able to draw on its logistics experience to provide disaster relief. In contrast to the official government efforts to deal with the disaster, which were considered uncoordinated and haphazard, Tzu-Chi was widely praised for its efforts.